D23 is the official fan club for the Walt Disney Corporation. Founded in 2009, the fan club offers two levels of membership. The more expensive gold level membership provides members in 2011 a membership card and certificate, an exclusive Mickey watch, access to D23 events and merchandise, a quarterly magazine which Disney touts as a collectible and special promotional offers and discounts. 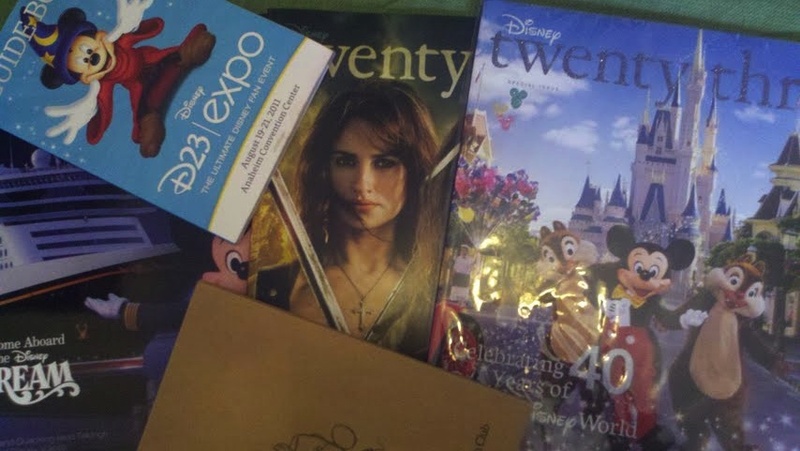 The less expensive Silver membership does not include the Disney twenty-three magazine. My history with D23 goes back to 2009. On its launch date I debated if financially it was a good choice for me to be a member. And on that first day I decided that it was not a good use of money for me. The deciding factor at the time was that it was an expensive magazine subscription since the likelihood of me every attending a D23 event or using the other privileges was non-existent. I felt pretty good about the decision, especially as podcasts I listened to discussed what Disney did wrong in launching a fan club, including price, and generally criticized this Disney mistake. But as the Disney twenty-three magazine hit the mailboxes of podcasters that were members my opinion began to change. The magazine actually sounded like it would be entertaining. And I got my hands on a sample and decided that I would become a member, especially since it became a birthday gift. I have never regretted being a member. In fact my regrets are that I am only a charter member and not a first day member. Over these few years of being a D23 member I have been satisfied. I live Between Disney which means that none of the D23 events largely placed in Orlando, Anaheim and major cities like New York are accessible to me. And a lot of the associated discounts largely impact those living in or near those cities. So, those are not items that draw me to D23. Though I have loved getting reports from blogs, podcasts and Twitter about events like the Expo and Destination D. But in the end I decided that for me D23 is a high end magazine subscription and anything else is bonus. And I really do enjoy seeing that magazine sitting on my step and I have read every article and every page of every issue to date. So when analyzing my membership this way I have been satisfied with what I have gotten. The magazine generally has a mix of coming soon (please spend money in the future) articles and historical articles and overall I won’t complain about the content. Now there have been bonuses. Every year I have received membership and renewal gifts. These include a lithograph that someday when I get motivated I fully intend to frame and hang up I promise maybe but at least it’s still safe in its mailing tube! I received a calendar of attractions that were never developed, and I really enjoyed the concept art though I never used the calendar. Does anyone really hang up a calendar anymore? And this year I got a D23 branded journal, it was simple enough that I have decided to use it to help keep track of my trips and Disney memories. I admit it; I forget things and want to have my family’s reactions to rides recorded as early as possible. Additionally I have gotten a watch that I occasionally wear and pins that I never wear. Finally with every Disney twenty-three I have received items like patches, mouse pads, car air fresheners and more all Disney themed. These gifts are not available to readers who buy the magazine separately at locations like Barnes and Noble. So overall, the bonuses have been nice, but most are on my save for good pile in my office since they have not caught my interests. D23 does produce the weekly “Disney Geek” online video series which highlights future events and movies. And the series is fun and though an attempt to separate me from my money entertaining. Additionally on a less frequent basis D23 posts the “Armchair Archivists” series which highlights items with the Disney Archives from props to photos and pictures. This series brings some really interesting pieces to Disney fans, like Walt Disney’s last recorded promotional video for the company. But one does not need to be a D23 member to access these online videos. So, there I was, perfectly happy and content with my D23 membership. Especially since Disneystore.com has exclusive D23 items which allowed me to get an autographed copy of one of Jason Surrell’s books. My expectations were lowly set and D23 was exceeding them in actually sending me a magazine every four months without hassle. But this year my D23 membership really paid off by allowing me to go to the 2011 Expo. So my membership also meant discounted tickets for the entire family and the ability to enter early. Which for my family meant we got a head start to wait in line to meet Phineas and Ferb and the “Voices of Phineas and Ferb”. And my 24 seconds of interaction with Dee Bradley Baker are honestly epic and priceless. And when I became a member I would have never anticipated that I would ever actually go to a D23 event and have my family interact with Talking Mickey. So in the end, for those of us Between Disney, D23 can still be a good investment. But you can’t expect D23 to bring the awesomeness to you, unless you feel a magazine is awesomeness. But us still far from the gates can use D23 to keep us in the know and make us feel connected even when we are miles and months away. Does a D23 membership help you feel closer to Disney while living Between Disney? It's our first ever contest. Tweet the message below before 12 p.m. central standard time December 7, 2011 to be entered in a random drawing. The winner will receive at least 5 pieces of D23 Expo swag including a Mickey Mouse button, a postcard and more. All of little to no value.